Retro Computers, the independent outfit that successfully crowdfunded a ZX Spectrum hardware emulator in the form of the Vega, has returned with a new Spectrum-flavoured project. Namely the Vega+, a PS Vita-esque portable games console that will emulate all your retro favourites on the move. Just like the original Vega, the Vega+ will have over 1,000 emulated games to play - only this time you don't have to plug the device into a TV to play them, instead there's a built-in display that makes it look like a cross between the chunky portable that was the Sega GameGear and the sleeker handheld efforts from Sony. 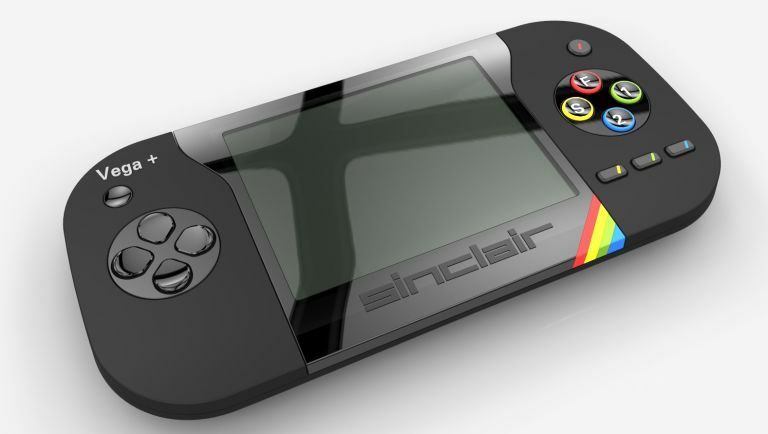 Luton-based Retro Computers once again has the backing of Sinclair Research (the company founded by Spectrum creator Sir Clive Sinclair) and has returned to Indigogo to get the cute handheld into production. The original Vega was successfully crowdfunded and even made it onto the market, so there's at least a track record there when it comes to seeing Spectrum-related projects through. For £100, you can secure yourself a Vega+ console (in a fetching blue, white or red) - or get it in the rather sleek looking black version pictured above. Said bit of kit will also comes with a MicroSD slot so you can load even more games. Retro Computers has been a little quiet with its specs, but it says it already has a working prototype ready to hit production.